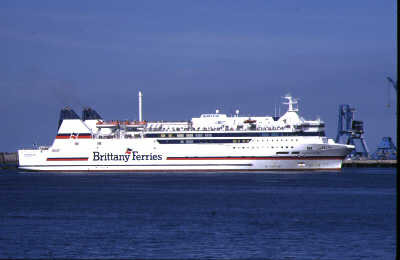 Brittany Ferries' Barfleur arriving in Cherbourg from Poole, August 1994. 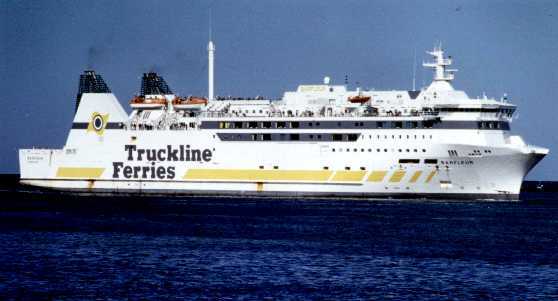 At this time she was painted in her original Truckline colours. 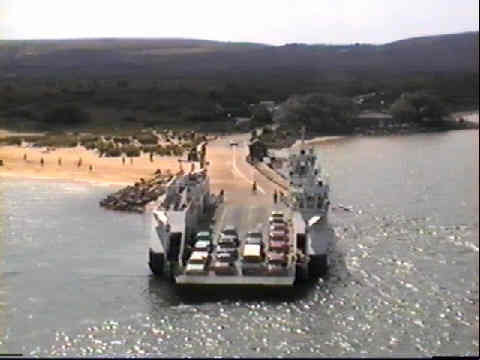 It was this ferry that started my love of France, and with it my interest in ferries. 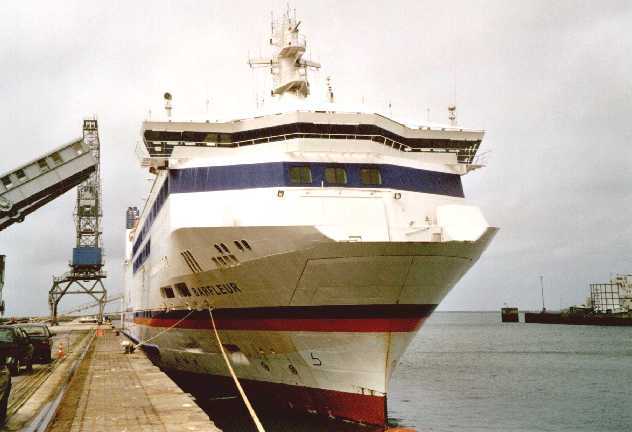 Barfleur arriving at Cherbourg again, this time in August 1999 by which time she was painted in Brittany Ferries colours. She's a comfortable, well equipped vessel, and I've enjoyed many crossings on her, be it for a day trip - out one night, back the next - or at the beginning or end of a holiday with the caravan or staying in a gîte. 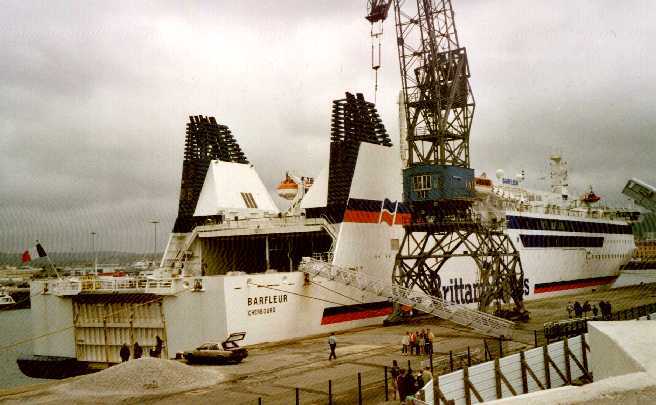 Next are two views of the Barfleur while she was berthed at Cherbourg in August 2000, she had been moved off the linkspan and was receiving some attention. Her daytime crossing time of 4 1/4 hours is the fastest (other than fast craft) west of Newhaven - Dieppe, long enough to relax, have a meal and get in the mood ready for your visit to France. She's not as big as some of her companions in BF's fleet, which gives her a more relaxed and friendly feel than, say, the Normandie, whilst still having all the facilities that you would expect in terms of catering and shopping. 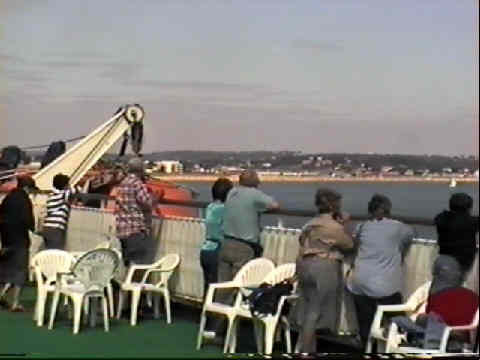 To finish, some frames captured from my camcorder taken while outward bound from Poole. The first is a view from the upper sun deck, forward through the bridge windows Sandbanks can be glimpsed. Next is a view back to the coast near Sandbanks, from here looking east you can see the coast along to Bournemouth a with distant view of The Needles on the Isle of Wight.